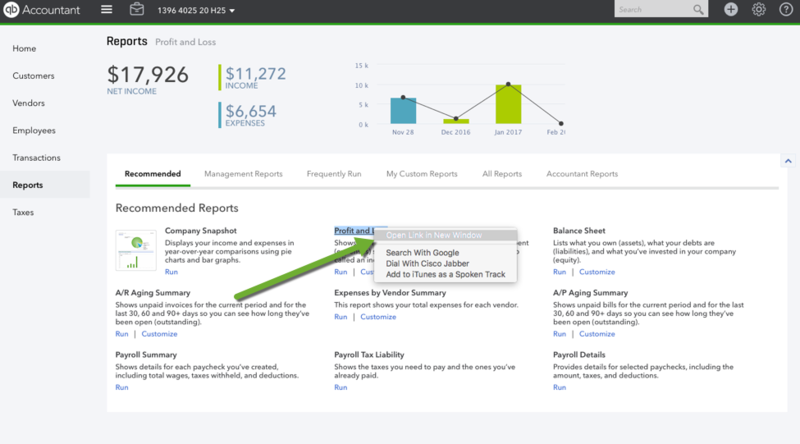 When using QuickBooks®, the ability to open multiple windows is a huge timesaver, and an easy way to make comparisons across multiple reports or QuickBooks features. 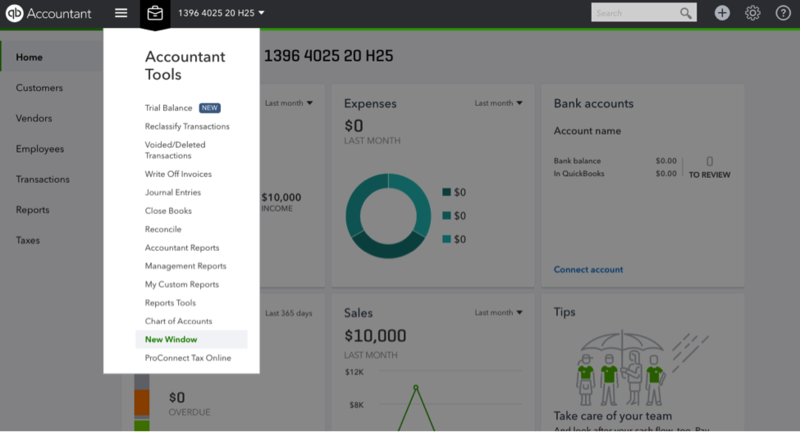 Multiple windows are commonplace among QuickBooks Desktop users, but QuickBooks Online Accountant (QBOA) users often don’t realize that they can take advantage of the time savings of multiple windows, too. There are a few methods to accomplish this, and we’ll give you the best practices to get the most out of QBOA. Download the thin client for PC or Mac, depending on your OS. Log in with your QBOA credentials. Important: Choose the name of your QBOA Firm from the company selection list. You will see all of your clients listed on this page, but won’t be able to access them unless you choose you Firm’s name from the list. Once logged into QBOA, you can start using New Windows right away by right clicking on any link, or choosing “New Window” from the File Menu. You won’t be able to have multiple client files in open multiple windows at the same time, but you will be able to see updates made in each window, reflected in real time across all windows. If you need to have multiple QBO client files open at the same time, you’ll need to follow a couple of extra steps within your web browser, but it can be done! Be careful with this approach, as you don’t want to get your clients’ books mixed up with one another! 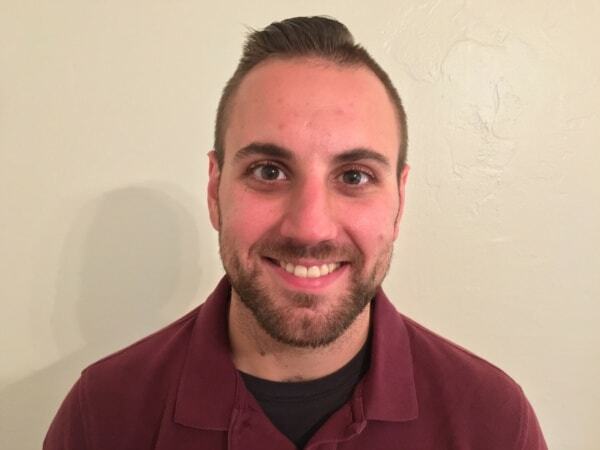 Set up multiple users within your browser. Google Chrome offers a simple way to set this up. You will need to sign into QBOA separately in each user window, but once you do, they operate completely independently from one another. Sign in via an incognito/private browsing session, or a separate browser entirely. Most web browsers offer a private browsing session as a feature that can be used to sign into a unique QBOA instance. You can also have multiple browsers installed on the same machine and log into QBOA separately for each browser. Be careful using this approach – QBOA has safeguards built in to help protect you from mixing up your clients’ books, but following the steps above removes those safeguards. Access the client you’d like to work on. Click on the Accountant Toolbox, and choose New Window. Your client’s QBO file will open in a new browser tab, and you can navigate throughout each tab separately. Unlike the QBO Desktop apps, these tabs will not update in real time, but this is a good option to quickly open a new page for comparison. Of all the options, the QuickBooks Desktop apps offer the most functionality around opening in new tabs. Hopefully, these tips help save you some time when navigating around client files in QBOA. If you’ve got more questions or best practices, share them in the QuickBooks Community to hear from other QBOA users.